In 2008, several thousand print copies of my first non-fiction book arrived at my house. I was so excited, sure that they would change people’s lives, bring me a great income and a new career. But weeks later, they were still sitting in my boxes in my living room. I realized at that point that I needed to learn about marketing—and fast! So I got into blogging, social, podcasting and video and things started to take off … then I moved into writing fiction and the education began all over again. Through experience, I’ve found that marketing fiction is a different beast to marketing non-fiction. The “platform” is still important, but in a different way and other things make more of a difference to direct sales. Cover design might sound like a publishing exercise, but your book cover is also critical for marketing. If you manage to get millions of eyeballs onto your book sales page and your cover is terrible, nobody will sample, let alone buy. If you pitch a book blogger, a journalist or a physical bookstore owner, one glance at the book cover will determine their interest. So this is a non-negotiable upfront task, along with professional editing to ensure you have a quality product. Non-fiction book covers have a trend for large words, focusing on the obvious benefit for the customer. But fiction book covers need to resonate with your target market, echoing the genre of the book and giving a taste for the story. Remember that authors are wordsmiths and generally not gifted in design. So don’t use a painting that you or your child have done, or try to design a cover yourself. One of the best resources on cover design is Joel’s e-Book Cover Design Awards. You can see covers by the best designers and they will generally do print cover design as well. You can also help the design process. Go into the Amazon store and look at the Top 100 books for the genre you are writing in. Notice what is similar about the bestselling books and take screen-prints to share with your designer. If you’re unsure about your genre, pick 3-5 books or authors that your book is like and see where they are categorized. This one tip will also carry into much of your other marketing, so it is critical to the process. 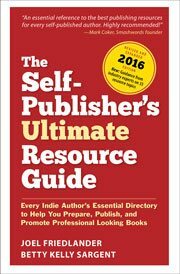 Your book is never totally unique, nor do you want it to be, because you want to find an existing readership and tap into that. As well as the book cover design, you need a compelling sales description, targeted categories, well-researched keywords, good reviews and appropriate pricing. Basically, the book sales sites will always be able to sell more books than you can so you want to make sure you optimize your book page. The best way to send your book to the top of the sales charts is to email your own list of fans. You can grow this specific list for your fiction by including a link at the end of your books. In my ARKANE books, it says: “Enjoyed Exodus? Sign up to be notified of the next ARKANE adventure here” with a link to a specific page on my fiction site, JFPenn.com. For non-fiction authors and online businesses, you can grow your list on your own website by offering something for free and attracting attention and traffic with content marketing. Joel does this effectively here at TheBookDesigner and I do the same at TheCreativePenn.com. But fiction readers mainly find books on the actual book sales sites, like Amazon, Kobo, iBookstore, etc., so your main method of capture is at the end of your book. Discovering this changed my own mindset on blogging to sell fiction and I rarely post on my blog at JFPenn.com anymore, preferring to use other discoverability tactics. Of course, it takes a while to grow your own email list and one of the best tactics for short-term sales spikes right now is to pay for a promotional service like BookBub.com which already has a huge list of readers ready to buy. These sites and services will change over time, so always assess the evidence for anything you decide to participate in. But if you have good reviews and a great cover, plus you can drop your price for a sale, this type of promotion can work well for a short-term sales spike. There are two types of reviews, both of which can be effective for fiction book marketing in particular. Customer reviews on Amazon, Goodreads and the other booksites. These feed into the algorithms that determine how your book fares on the various lists and also have an impact on visibility. They provide social proof on the book sales page so more customers will buy. One way to get reviews is to build an email list (as above) and give them books for free. But you should also be including a notice at the back of your book, thanking people for reading and asking nicely for a review. Linking to the sales page is a good way to redirect them back to it. Reviews by book bloggers and other media. These can help generate word of mouth sales by bringing your book to the notice of avid readers in a genre. Because many of the bloggers read each other’s sites, you can also end up featuring on a number of blogs. One author who did this successfully was Rachel Abbott, author of ‘Only The Innocent’ who made it to #1 on the Amazon.co.uk store and remained there for months on the strength of book blogger support. Pitching book bloggers takes time because you have to focus on researching the ones that will like your kind of book. There are people who say social media and ‘platform’ are a waste of time when it comes to selling fiction. I agree that it is less effective for direct sales than for non-fiction BUT I still think it is essential for longer term marketing. I’ve been blogging, podcasting and social networking for nearly 5 years now and it is the people I have met along the way, the personal connections I have made that have led to the most amazing opportunities. Those in turn have led to more direct sales, income and possibilities for my fiction. For example, connections made through Twitter and my blog have led to Pentecost being included in an Amazon Daily Deal, commissioned short stories by Kobo for Dan Brown’s launch of Inferno, international speaking opportunities, an introduction to my New York agent, a joint venture to exploit my German language rights, my audiobook deal and much more. Even this guest post is a result of Joel and I meeting online years ago and mutually supporting each other over time. Co-opetition means co-operating with your ‘competition’ for mutual benefit. Fiction readers are often voracious, finishing a favorite author’s latest book in just a few hours. We can never satisfy a reader’s appetite for books alone, so it’s a great idea to work with other authors in the same genre to promote books that those readers will like. There has been a rise in multi-author blogs for fiction, multi-book box-sets of ebooks in the Kindle store and promotion of each other on social media. I’m part of Killer-Thrillers.com which has a great list for thriller lovers offering free or sale thriller books. I’m also producing Killer Thriller TV, interviewing top thriller authors which promotes them as well as my own fiction brand. So all the platform tactics are still useful, but the focus should be more on longer term branding, connections and ways to reach readers in a genre by working with other similar authors, rather than immediate, direct sales. Probably the best way to sell more fiction is to write more fiction! More digital shelf space means more visibility, and often the best way to sell more books is to launch a new one that can bring more readers to your backlist. Of course, this takes time, so many authors are also playing with novellas and short story collections to entice readers with great content that doesn’t take so long to write and produce. If you have work of different lengths, you can also play with pricing models and promotional sales, which is difficult to do with one book. I hope I’ve given you some new ideas around fiction marketing. There’s a lot more covered in How to Market a Book but these are some fundamentals that will get you started. How to Market a Book is out now and already an Amazon #1 bestseller. You can buy the book on Amazon, and if you want more marketing information every month, you’ll want to find out about the Premium audio course. Joanna Penn is the author of ‘Career Change’. She also writes the bestselling ARKANE thrillers under J.F.Penn. Joanna’s site for writers www.TheCreativePenn.com has been voted one of the Top 10 Blogs for writers 3 years running and offers articles, audio and video on writing, publishing and book marketing. Connect with Joanna on twitter @thecreativepenn. Photo: bigstockphoto.com. All links have my affiliate code. If you’re not reading Joanna’s blog, today is a fine day to start. Though people don’t like to be outright “sold” on social networking platforms, they are a great place to make announcements throughout the writing process. This starts a buzz within your immediate network that hopefully extends out into your friend’s and family’s networks and beyond. The more people hear about you and your work, the more they will look for you and your work. Thus combined with #5 and you are in there. Never stop your marketing push. Email lists are so underrated and underused by authors. It’s still tough to convince some people of benefits of email list. Good to see more advice to use them. And giving away Audiobook is nice idea, always new short-stories could be a used but audiobook might be even better option. Altho, not everyone listens to them. Another option could be, maybe, a free book given away in a serialized manner, weekly chapters sent to readers for example. It would keep the author constantly on the reader’s mind thus increasing the familiarity and brand name. In the context of building your list, what TYPE of freebies would be most suitable for attracting fans of the type an author would want? Hi Venkatesh, I have a short story ebook and in audio format as well for my list subscribers, so it is directly related to my fiction. BUT/ I think most fiction list subscribers will come from the back of your books i.e. they read the book first – which is different from many non-fiction writers – so make sure you have a clear signup from the back of your books. I also do giveaways specifically to my list e.g. signed print editions. Thanks for the response, from which I gather that it would not be possible to have sign up in the back of print books. Is that right? yes, you just put the URL in words for print books e.g. Love the co-opetition suggestion. I think blog tours fits right in there and it’s an area I’m trying to figure out how to do more of. It’s definitely about making connections over time Rhett. Connect with authors at the same level as you right now and you’ll grow together 🙂 Joel and I “met” online nearly 5 years ago now, when we did the same blogging course and started our sites at about the same time. We connected on twitter and “connect” on the networks regularly – I’ve done the same with many others I have never met physically. We’re lucky to have a community worldwide now, so just start connecting, sharing, being generous and friendly and you will start to grow that network yourself. Thanks, Joanna. I’ll be checking out your advice. Marketing is kind of painful for writers. In learning the ropes, I’ve discovered some valuable strategies and author services and plenty that are not so great. Hi Linda, yes, you have to evaluate what is worth pursuing – sometimes that is trial and error, but it’s great that we can also share our lessons learned. It’s also worth trying to reframe marketing as ‘fun’ since we avoid pain and pursue pleasure 🙂 Try to find things that work for your life that you can sustain longer term. Great advice, Joanna. I especially like your co-opetition idea. Just wanted to say that I’m totally on board with the idea of “co-opetition” (even though it’s a bit of a tongue-twister). Others in the same field are colleagues and, since we have the same general aims when it comes to helping authors publish and promote their books more effectively, it makes good sense to cooperate. Besides, that’s one of the ways I meet people like Joanna. Perceiving your peers as competitors puts you into an adversarial relationship that has far fewer opportunities for growth, cross-fertilization of ideas, and cooperative marketing. Absolutely Joel, and I think it is one of the things that sets the indie community apart. There is very little antagonism amongst our peers which I love – it’s very supportive and sharing!